Salome Alexandra or Alexandra of Jerusalem (139 – 67 B.C.E.) 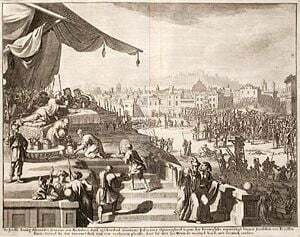 was the only Jewish regnant queen of the Hasmoneans, reigning from 75 B.C.E. until her death in 67 B.C.E. A supporter of a religious reform that favored the early Pharisees against their bitter rivals, the Sadducees, she is seen in Jewish tradition as having instituted a brief golden age which helped lay the foundations for the later emergence of rabbinical Judaism. The daughter of a prominent Pharisaic family, Alexandra was the wife of the Hasmonean king Aristobulus I. On Aristobulus' death (103 B.C.E. ), she helped liberate his brother, Alexander Jannaeus, from prison, enabling him to become king, and soon married him. She used her influence as queen to help the Pharisees but was later forced to acquiesce as Jannaeus brutally suppressed them in favor of the Sadduucean nobility. At the end of his life, Jannaeus willed the government to Alexandra. She managed to secure Pharisaic support for the continued Hasmonean monarchy and again brought the Pharisees to prominence in government. She is credited with helping them to lay the foundations of nationwide educational and judicial reform. Although her son Aristobulus II reversed her policy and ultimately lost control of the kingdom to the Romans, Alexandria is highly regarded in Jewish tradition. Except for the much earlier and much-reviled Queen Athaliah of Judah, she was the only reigning queen in Jewish history. Salome Alexandra is traditionally believed to be the sister of the early Pharasaic leader Rabbi Simeon ben Shetach. Her husband, Judah Aristobulus I, was the eldest of the five sons of the Hasmonean ruler John Hyrcanus. He was the first of the Hasmonean princes to call himself "king." Hyrcanus had intended the country to be governed by his wife after his death, while Aristobulus was originally to receive the high priesthood. Not satisfied with this, Aristobulus cast his mother into prison, where she died, and took control of the throne. After a short reign of only about one year, he became seriously ill and died in 103 B.C.E. Aristobulus had been particularly hostile to the Pharisees, who had arisen in opposition to what they saw as the Hasmonean corruption of the priesthood resulting from the fusing of the royal and priestly powers. Salome Alexandra, however, did not share her husband's religious attitude. Soon after Aristobulus' death, with the help of other members of her family, she freed his oldest brother, Alexander Jannaeus, from prison and married him. The marriage was seen as being in accordance with Jewish law, since she had been left childless by Aristobulus. Alexander Jannaeus at first busied himself with military issues and allowed his queen a major role in the nation's internal affairs, especially with regard to religion. A partisan of the Pharisees, she removed the Sadducees from positions of leadership in the Sanhedrin (central religious council) and installed Pharisaic scholars in their place: most notably her brother, Shimon ben Shetach in the position of nasi, or president. Together with him and Yehoshua ben Gamla, she is said to have been instrumental in encouraging the introduction of synagogue schools in many towns to teach young children the Torah. After Alexander Jannaeus successfully concluded his military campaigns, however, he began to undermine Alexandra's support of the Pharisaic party, throwing his support to the religious nobility, who were generally Sadducees. Like other Hasmonean rulers, he held the position of high priest as well as king, and brutally suppressed a Pharisaic rebellion to his religious policy. Some 800 Pharisaic teachers were put to death together with their families, and Salome's brother, Shimon ben Shetach, was forced to flee for his life. However, Salome's marriage to Jannaeus seems to have endured this crisis. On his deathbed during a military siege which he had undertaken, he is believed to have repented of his sins and recognized her wisdom. In any case, he entrusted the government to her, rather than to his sons. One of Salome Alexandra's first acts as reigning queen was to open negotiations with the leaders of the Pharisees, whose whereabouts she knew despite their having gone into hiding. Having been given assurances as to her future policy, they agreed to give Alexander Jannaeus' remains the burial due to a monarch, despite the bitterness of his persecutions against them. By this step Salome avoided any public affront to the dead king, which would certainly have found expression at his funeral without Pharisaic support. The Pharisees, who had suffered intense misery under Alexander, now became not only a tolerated section of the community, but actually the ruling class. Alexandra installed her eldest son, Hyrcanus II a man wholly after the heart of the Pharisees, as high priest. Gradually she and Hyrcanus pushed the Sadducees out of every important office and returned the Pharisees to the important positions of influence. Shimon ben Shetach again assumed his position at the head of the Sanhedrin. This institution had hitherto been an aristocratic body much devoted to its own interests. Under Alexandra, it became more of a supreme court for the administration of justice and religious matters. Education was also placed in the hands of Pharisaic teachers. A major result of this reform was not only an increase in literacy and religious knowledge among the young, but also a broadening of the Jewish sense of scriptural authority. The Sadducees had accepted only the Torah, or five books of Moses, as authoritative. Under the Pharisees, the Prophets and the Writings were also taught, as well as a belief that God's Oral Law could be expressed directly by the living sages of each generation. Jewish tradition holds that under Salome Alexandra's reign, Shimon ben Shetach, together with Rabbi Judah ben Tabbai, also took care to see to the needs of the many widows and orphans that had resulted from the wars of Alexandrer Jannaeus. The Pharisees, however, did not treat the Sadducees too gently. Diogenes of Judea, on whose advice Alexander Jannaeus had acted in the earlier mass execution of the Pharisees and their families, was himself executed. Fearing mass retribution, the Sadducees petitioned the queen for protection against the now-ruling party. Alexandra, who desired to avoid all party conflict, removed the Sadducees from Jerusalem, assigning them several fortified towns for their residence. Alexandra also increased the size of the army and carefully provisioned the numerous fortified places, so that neighboring monarchs were duly impressed by the number of protected towns which bordered the frontiers. Nor did she abstain from actual warfare. She sent her son Aristobulus II with an army to besiege Damascus, then beleaguered by Ptolemy Menneus. However, the expedition was reportedly without result. The last days of her reign, however, were tumultuous, as Aristobulus II, in league with the Sadducees, endeavored to seize the government. Only her death saved her from the embarrassment of being dethroned by her own child. Salome Alexandra's policies did not last long after her death. Aristobulus II seized the throne from his older brother, Hyrcanus II, after her death. A civil war soon followed, and eventually the power of Rome was brought to bear on the situation. The result was the demise of the Jewish state and the establishment of Roman sovereignty. In the aftermath, ruthless client kings such as Herod the Great and governors like Pontius Pilate came to rule over the Jews. Rabbinical tradition, which emerged in the wake of Pharisaism's ultimate triumph over the Sadducees, holds Salome Alexandra in very high regard. One legend relates that during her rule, God blessed the rain with rain falling only on the Sabbaths, so that the working class suffered no loss of pay by having rain fall when they could be at their labors. The fertility of the soil was so great that the grains of wheat grew as large as kidney-beans. Oats grew as large as olives, and lentils as large as gold denarii (Ta'anit, 23a; Sifra, ḤuḲḲat, i. 110). Succeeding generations honored Salome Alexandra's memory by naming their daughters after her, one of whom attended Jesus at the Cross and at his entombment according to the Gospel of Mark. In Jewish tradition, she is also known as Shelamzion or Shlomtzion, meaning "Peace of Zion," which also became the name of a short-lived Israeli political party. This article incorporates text from the 1901–1906 Jewish Encyclopedia, a publication now in the public domain. All links retrieved August 11, 2015. This page was last modified on 11 August 2015, at 18:42.